Pet peeves: People who are negative; people who talk too much and listen too little; people who tend to say no before they consider "the yes;" people who are quitters as they are too lazy, ignorant, or a combination thereof to do better; people who lack motivation but want others to make things happen for them; sagging pants on young men; when my employees make silly errors that cost me revenue and lastly, when people sign up for things and are not fully committed, thereby negatively impacting results. That's all... not much. My family, particularly my children and who they are as human beings, followed by my business and entrepreneurial conquests which include: becoming the first African-American at the L.A. Times (LAT) to be a Dual-Director as Director of Inside Sales at LAT and Director of Advertising for the Recycler, a separate L.A. Times-owned media business; launching the largest black-owned circulating newspaper on the west coast, Our Weekly; and starting my e-commerce business, a natural and organic skincare line, Kalaiaah. My mother. She was an amazing person, incredibly courageous, authentic, striking woman who raised her family in the church and struggled to shield us from gangs, drugs, and violence while living in the heart of South Central LA. She was "Big Momma" to many and transitioned in September 2015. Sunglasses will give me the ability to see things, while hiding my eyes. A body pillow can serve as a mini mattress, warmth, and comfort. A swiss knife; it does it all... right? It's very hard to pick only one, but I would say Kim Spradlin. 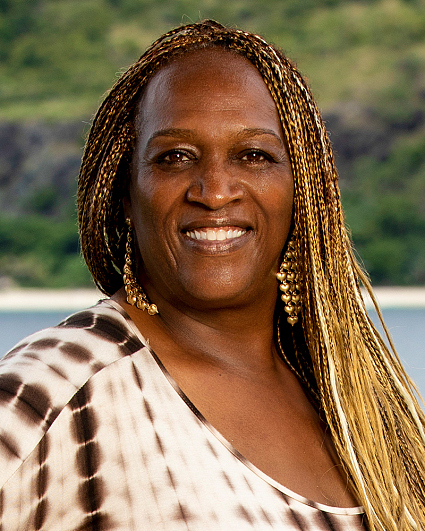 I operate a lot like Kim as we are logical, strategic, and calculating but I'd like to think I would bring more excitement to the game as that season was a bit predictable. I love to do over-the-top challenging things that are totally outside of my norm, especially if someone says or expects that I cannot do it. I don't want people to ever think that I am predictable or for them to categorize me in restrictive ways. I have accomplished many things in life that my friends and family will not and often cannot do and yet they live vicariously through me and my sharing experiences and that is priceless. My other motivation is that Survivor is my dream come true adventure that I know I can absolutely win. To have the opportunity to compete and then to become the Sole Survivor and win the money, is like actors who make a living "acting," live glamorous lives and can then be rewarded Best Actress/Actor at the Oscars. I am analytical, logical, calculating, strategic, and can read people well even when they are not openly sharing. I am a young 57-year-old with great energy and people often guess my age to be 10-15 years younger than I am. I understand the game and have always been a risk taker. I am not afraid to make big moves. I am a strong competitor in all that I do. I got this.